Hey, everyone. It’s Naomi Findlay here from the rapid renovation formula. Today, I want to talk to you about the importance of considering the floor plan before you renovate. It is so exciting to get in there and rip and bust and demolish, but you must think about your floor plan before you do any of that. There’s three things I want you to consider in regards to your floor plan. The first thing is knowing who your market is. I want you to know everything about who the market is for the property that you’re renovating. Whether it’s to sell or lease in the end, I want you to know what their needs are. Are they down-sizers? Are they families that need larger living areas and an indoor/outdoor space? Are they young professionals that need streamline, modern living and a sophisticated entertaining space? You need to know absolutely everything about your market because that will then allow you to feed into step number two: knowing how they’re going to live in each and every one of those spaces. Once you know who your market is and you know their needs and their wants, you can actually look at the floor plan of your property and work out how they’re going to live in each and every one of those spaces. What are the functions of those spaces? What are they going to need in those spaces to make them ideal for them? How are you going to deliver that? Either with the way you lay your furniture out or the actual floor plan of the property itself. That’s the first two. The first one is know who your market is, the second one was know how they’re going to be living in each and every space within that house. Now, the third thing that I want you to think about when you’re looking at your floor plans is how you can add additional value. It’s essential that you nail what is already there, but it’s also important to look at how you can add and squeeze extra value into that floor plan. It could be as simple as adding a study nook to the kitchen. It could be as simple as enclosing an old second dining space. Many of the old 80s properties had two different dining spaces, which now days are a little bit redundant in many homes. It could be creating a bedroom out of that or creating a guest space out of that or using that as an ensuite space. It’s about looking at what you have there and trying to squeeze extra value out of that. It doesn’t have to be structural. It could be something as simple as adding extra storage at a higher level above the kitchen cupboards or increasing the footprint slightly of the kitchen island to create an entertaining kitchen rather than just a functional kitchen. 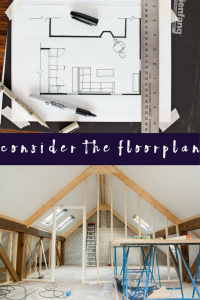 These are three things that I always want you to think about when you go have a look at the floor plans of your renovations – which needs to be one of the first things you do. Before you rip, tear and bust with demolishing, look at your renovation floor plans, think about who the home is for, who your market is. The second one is how they’re going to live in it. The third one is how you are going to add value. Thanks so much, guys. I will be back next month with some more tips on how to add value to your property and how to renovate for wealth. See you then.